Inspection of the chassis. 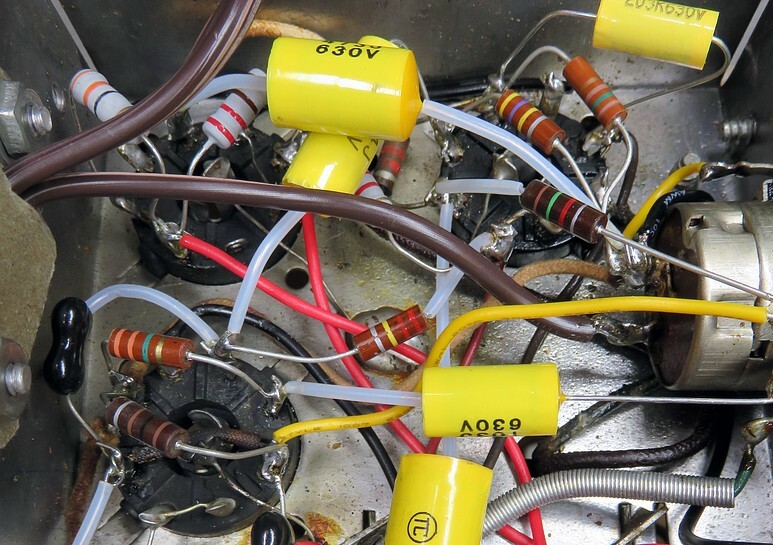 The first thing we see, at the bottom center of the photo, is a large capacitor flopping around. IT HAS A METAL BRACKET ON IT! 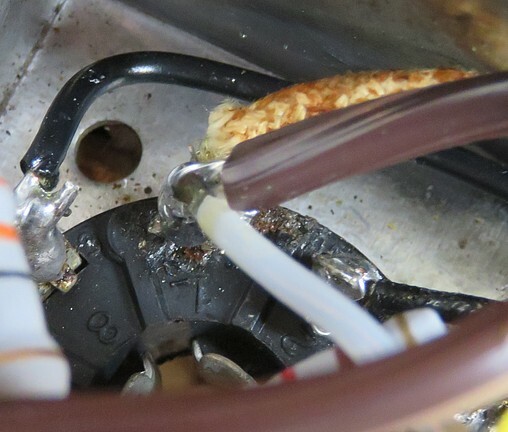 When the radio was turned over, the metal bracket had wedged itself between two of the pins on a tube socket, shorting them out. Apparently, a previous "repairman" relied on GRAVITY to keep the bracket out of the circuit. 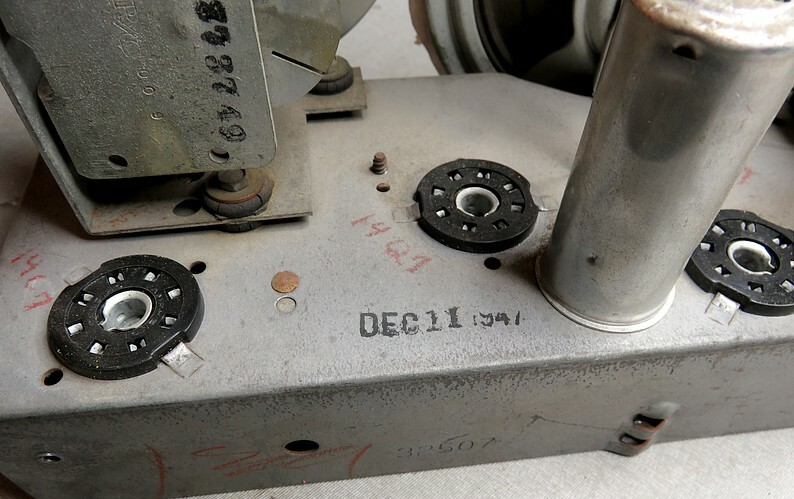 The date stamped on the radio. 1947 was the year Galvin Manufacturing Corporation officially changed their name to Motorola, Inc. The brand name "Motorola" had been around since 1930 when Paul and Joseph Galvin began manufacturing car radios. The car radio had been invented by William Leer and Elmer Wavering, then perfected by them and Paul in Galvin's shop. The set contained five Sylvania tubes and an RCA audio output tube. 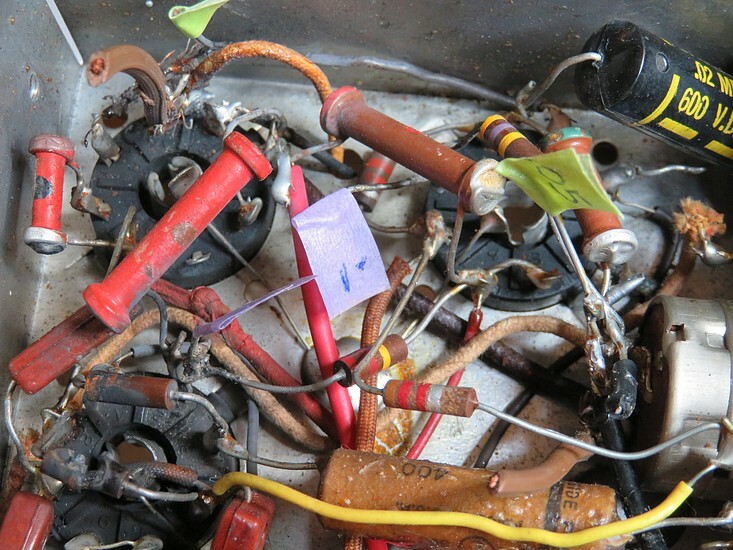 Since Motorola made their own vacuum tubes, it's likely this set went through at least one complete set of tubes. The Sylvania tubes tested good except for the 14B6 (Detector and Automatic Volume Control). 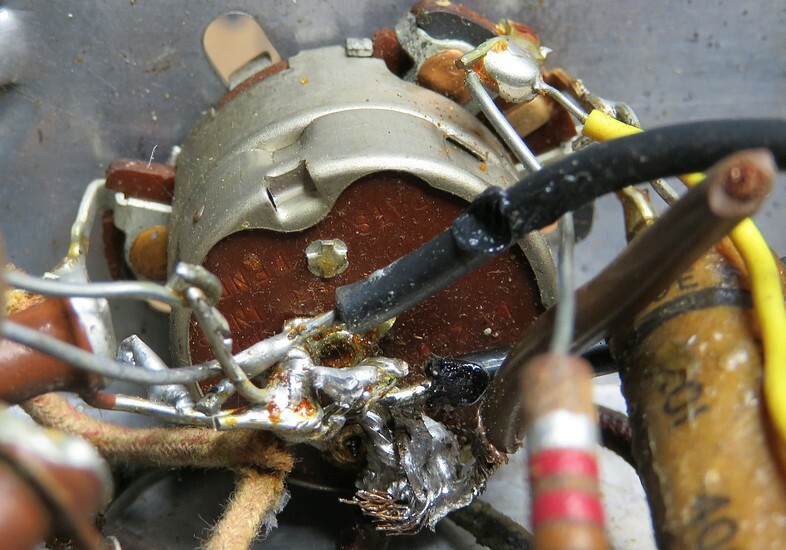 The RCA 35A5 audio amp couldn't be tested. There was no listing on the tube tester. This radio was repaired in the past. 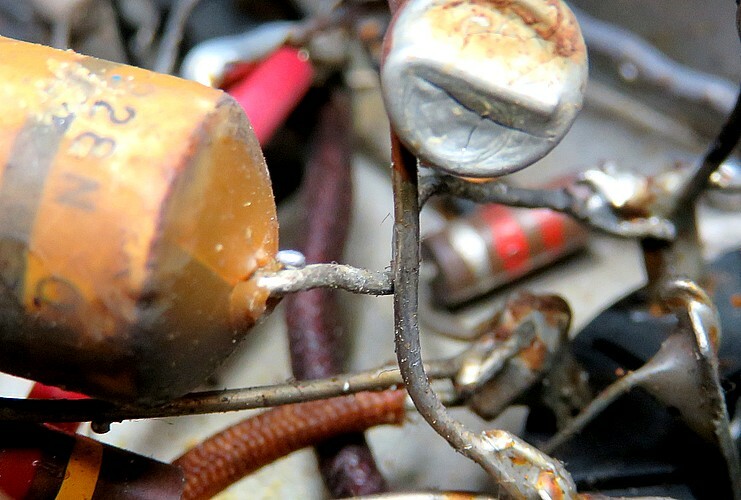 From the looks of the capacitors, it was a long time ago. 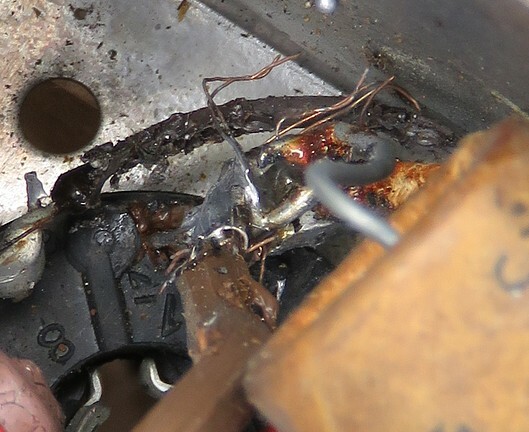 It seems the repairman didn't use any solder and just reheated whatever was already there. 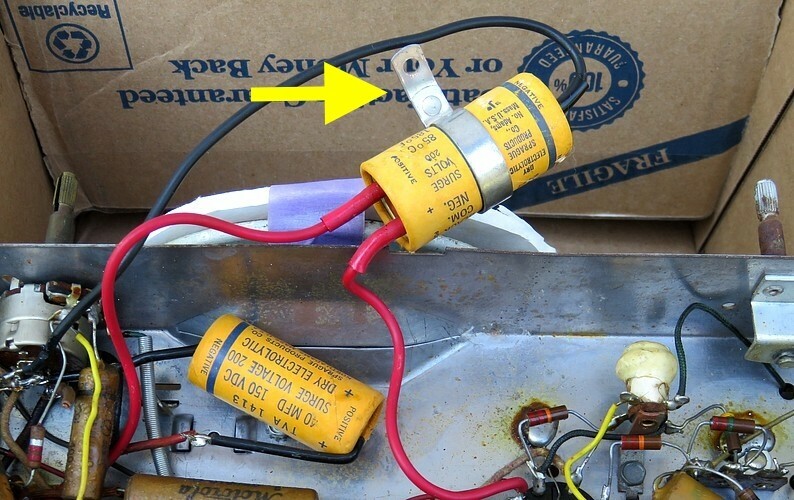 Two replacement capacitors are wax coated Stromberg Carlsons; two are paper Stromberg Carlsons with no wax. Two are wax coated made by Sprague and one is a plastic Sprague. The craftsmanship (or lack of) shows that at least three people worked on this, probably four, with the later addition of the plastic Sprague capacitor. 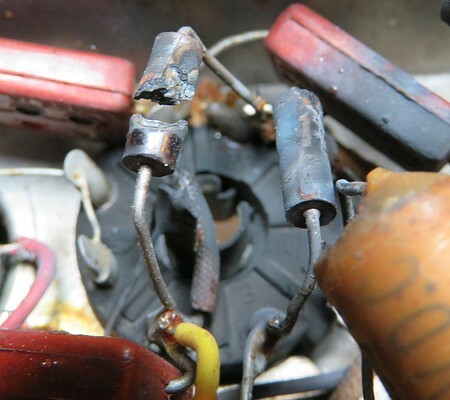 Finally, there was the guy who replaced the AC cord and ruined the radio. After working on this radio, I can say that the fact that he even tried to replace the cord is a testament to his courage. "Solder? We don't need no steenking solder!" 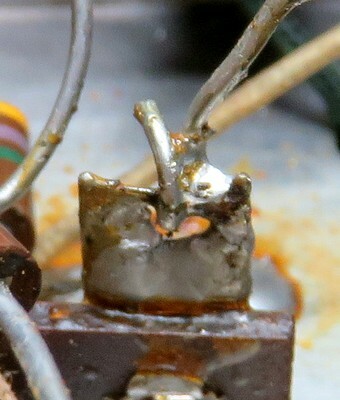 Here's the exploded resistor and what I think caused it. 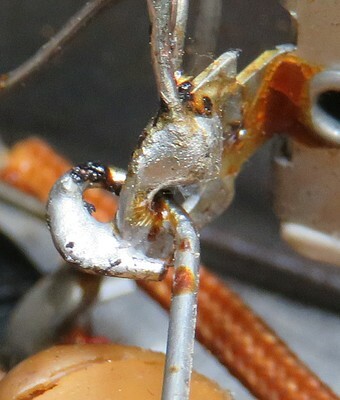 On the right, a new line cord has been soldered to pin 1 of the rectifier tube. (The number 1 on the socket is upside down in the picture.) 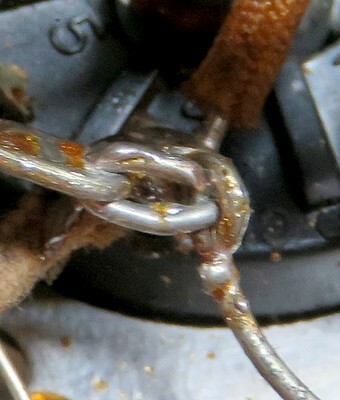 Some strands of wire from the cord are touching the chassis. This is as close as I could get with the camera. 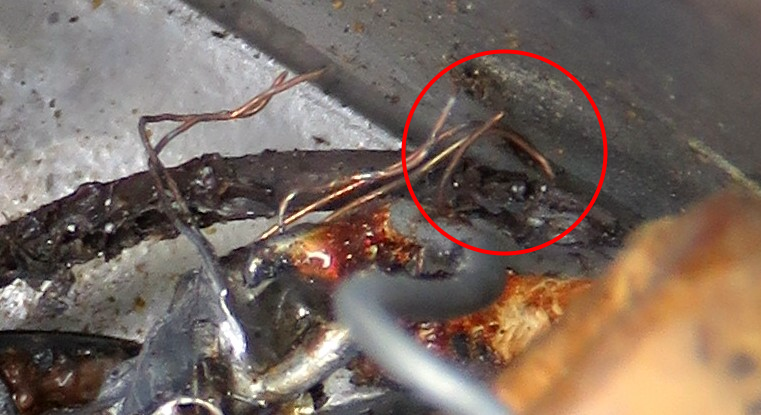 There appears to be a burn mark on the chassis where the wire is in contact with it. 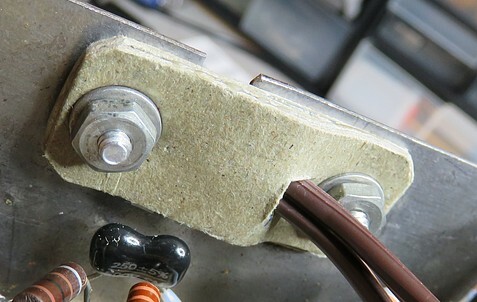 It was tested with an ohm meter and it is a very good connection. Probably better than some of the intended connections. So touching. This should be a Hallmark card. When I viewed the On/Off switch connections I was "stricken dumb with astonishment and amazement which bordered on stupefaction." 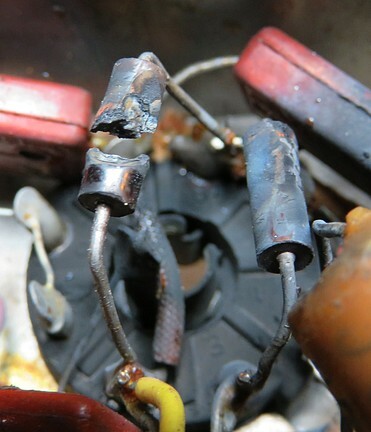 Two capacitors have been removed just to be able to see this mess. 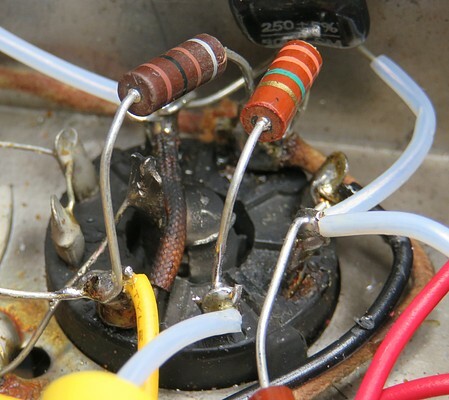 How do you get a soldering iron in there? Almost every component was replaced. 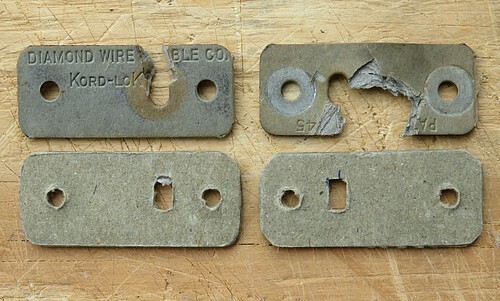 Teflon "spaghetti" insulates many of the leads, sometimes needlessly. 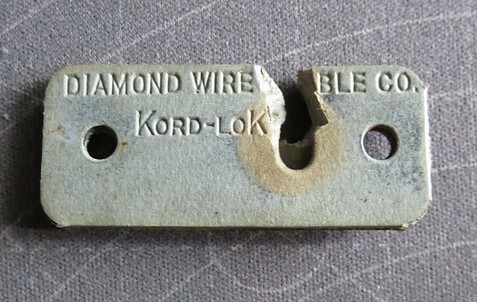 Apparently, the way to replace the AC cord is to cut the connections to the radio, then destroy the "KORD-LOK" strain relief by digging the cord out with a screwdriver. 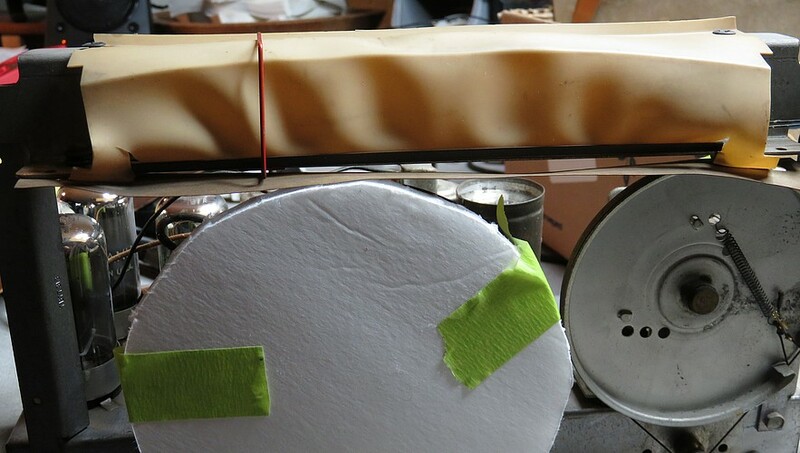 Crude replacements made of cardboard and glue sandwiches, covered in Polyurethane. They work as well as the real deal, the cord is cinched down unbelievably tight but it's very gentle on the cord. I was going to use pop rivets to hold them in place but reconsidered. The Motorola rivets were probably used to keep the production costs down and the repair costs up. Revisiting the scene of the crime. The exploded resistor has been replaced. The new filter capacitor. 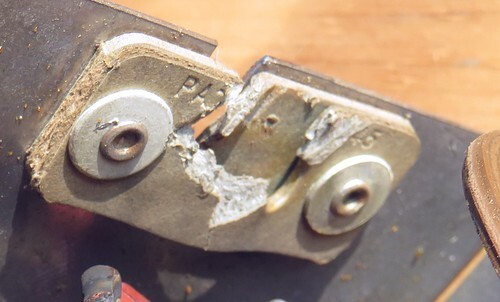 The metal bracket from the old one was used to hold it in place. 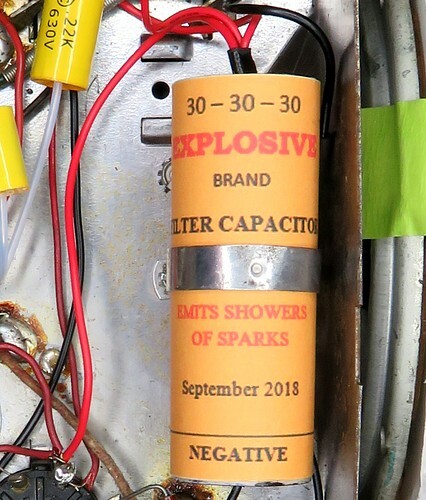 "EMITS SHOWERS OF SPARKS." Before we can turn the radio on and try to tune in a station, we have to remedy another problem. 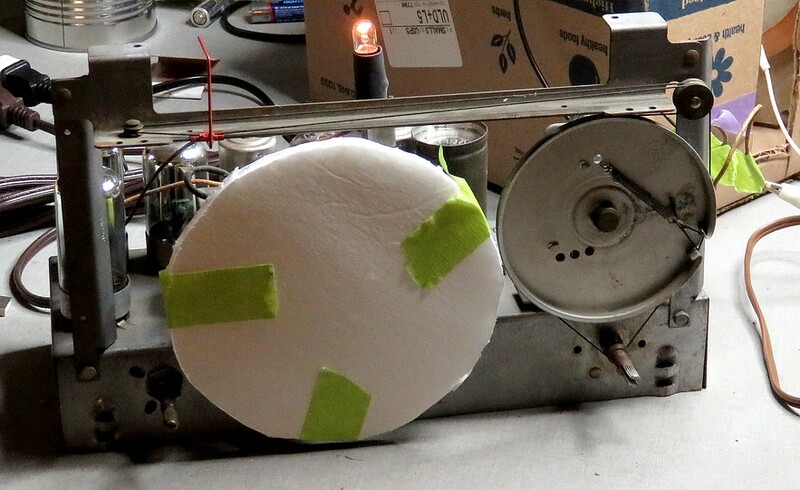 There is a piece of plastic that is illuminated by the pilot light to make the dial face glow. It has warped to the point where the dial pointer has to bend as it is dragged across it. The plastic piece was removed, and the radio was turned on. 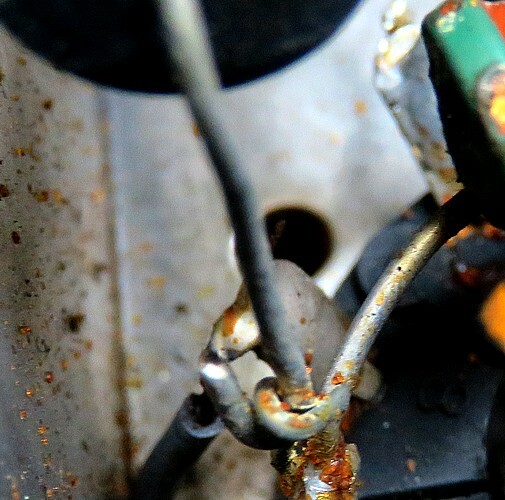 The pilot light, which once worked, decided to burn out. It was replaced and the radio was turned back on. The light came on but the radio picked up nothing. It was as dead as a doornail. I "shared the experience" with Andrea, thinking I would impress her with my handiwork. The same thing happened last year with the Westinghouse "Refrigerator Radio." I couldn't turn around and look at her. 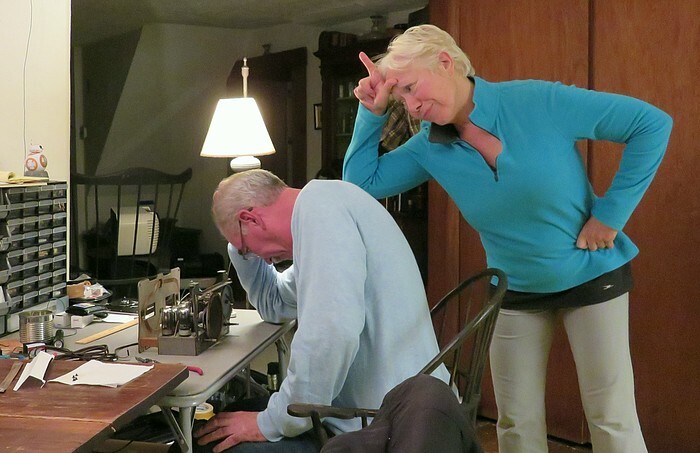 If I found out she was making that "loser" gesture at me I'd be humidified. DOH! If I don't get this set to work, all that sanding and painting of the case was for nothing. There are seven coils in this radio. What if one burned open? The IF cans were checked before I started, but the oscillator coil is giving strange results, as well as the 14C7 RF amplifier tube. Pins 3 and 4 should read about 50K ohms each, but read wide open. I now have a bit of anxiety. What if I never get it to work? 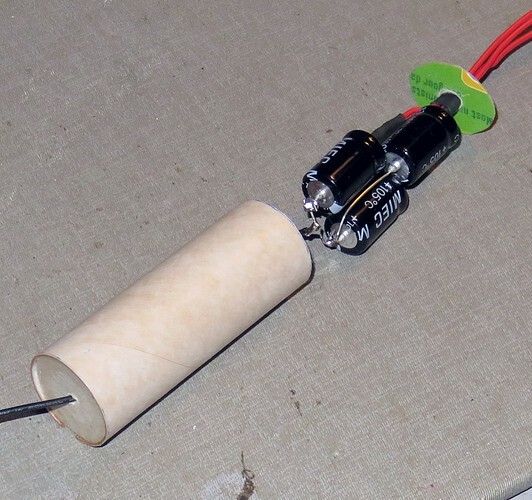 This 10KΩ resistor is testing INFINITE ohms. 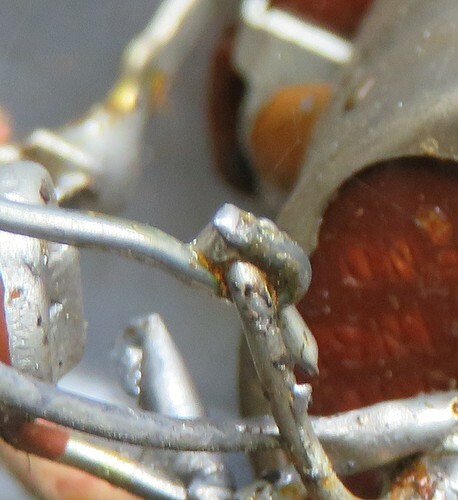 It is between pins 2 and 3 of the 14C7 vacuum tube. I never gave a thought to it. Almost everything in the radio was replaced, but I didn't even glance at this.